The great romance of American pioneering is much richer than history makes it. The intimate annals of family experiences and personal adventures provide the countless dramas with which American progress is associated. Thrilling stories and plays have been founded on the individual heroism of the early settlers of any country. Interest in the human factor always transcends interest in the political evolution. One of the most dramatic events of western history was the opening of the Cherokee Strip to settlement; really it might be called the last frontier in the United States. The Cherokee Strip consisted of 9,400 square miles, a tract of land 200 miles long and approximately 57 miles wide, east and west, bordering on the south line of Kansas, on the east by the Osage Reservation and on the west by the Texas Panhandle. The Cherokee Indians were paid $8,300,000 for their holdings or more than was paid Russia for Alaska, which was $7,200,000 in the year 1867. Before settlement President Cleveland had the coveted land surveyed and laid out in quarter sections which were the limit of the individual allotments and into properly related town sites. There was much pressure to make the distribution by drawings, but the government felt that it could not sponsor a game of chance, much less a lottery. The drive from the border was selected as the best method. That meant a test of endurance as well as a test of speed. A white stake marked the center of each farm and town lot. Under the rules the man or woman who first reached a farm or town lot and wrote his name on its stake was the owner of it. Long before the day of the great race, the homesteaders gathered on the Cherokee Strip borders, some on the Kansas side and others on the Oklahoma side making a great human fringe. The vast encampment was orderly, friendly and expectant. But when the race started, it was for blood. They were held back by soldiers until high noon on September 16, 1893 when at the crack of signal guns the mighty torrent of men and women, on horseback and in all kinds of conveyances, swept in across the new empire. The opening of the Cherokee Strip was the grandest “wild west show” ever enacted. An uncle of mine, Allan Noyes, had made the run into the Indian Territory in 1889. This was a sort of training school for the rush into the Cherokee Strip four years later. Naturally, my father being a younger brother and now twenty one wanted to make this second rush. Uncle Allan was the teacher for the group that went with my father. My mother and father, myself (1 and 1/2 years old) and sister Ormal who had been born at Uncle Allan’s farm near Miller, Oklahoma, the preceding May 23, had been living with this uncle for nearly a year. In the meantime ten friends banded together and prepared for the run into the “Strip”. So large a group was necessary for protection due to the lawlessness of the times. Claim jumpers that had brought their own stakes or “sooners” would shoot on the instant over any provocation. For several days before the run the men assembled at Orlando Oklahoma at a farm where friends of one of the group of ten men lived. Days before the men had gone into the Strip choosing a desirable place about midway or nearly a 30-mile ride from the border. The farms selected were adjoining ones in a bend of two streams called Red River and Bunch creek. Choosing farms close together was for protection in the earlier rush of settlement and later for neighbors that were not strangers. But men from the Kansas line were also watching these same choice farms and as it was exactly midway in the Strip, the men who reached there first would be the ones to stake the claims. My father, Paul Noyes, had a fine saddle mare of racing stock that he had brought from Missouri to ride at the opening. Pansy was greatly beloved by my father. The other men had less desirable horses to ride but they were stronger and in the end proved the best for the purpose. On the morning of September 16, 1893, everybody was lined up on the border. All carried bread in their pockets as that would be the only food available for the horseback riders. Many would go in with wagons and carry food with them, but they would be hindered in their speed and might not get a claim. The soldiers burned off the prairie to rout all “Sooners,” the people who had gotten in ahead of time. Animals came running toward the border. My father always told about the frightened deer and wolves. The blazing prairie was no more dangerous than the guns of the men lined up on the line. On Saturday, September 16, the wind was favorable for the Oklahoma line settlers. At the crack of the soldiers’ guns at exactly noon, the ten men with Uncle Allen as leader, started pell-mell on their mad rush across the prairie now burned black. For two and one-half hours they pounded across the country and the horses’ feet were sore from the flinty rocks and covered with foam and sweat. They made a final burst of speed when they could see the Kansas riders coming from the opposite side. Racing now to the limit, my father punished his mare, Pansy, cruelly to get to the desired claims first. 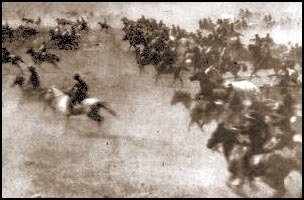 Horses and riders were severely winded when they finally arrived at the same time as some of the Kansas line settlers. Father and another man both claimed the same claim, but father paid the man $25 to get him off which was satisfactory to the other man. Now the ten men were busy defending their claims. As they had arrived at half-past two in the afternoon, the group began to look for water. Only a very thirsty person would have drunk the dirty water they finally found in a slough. Uncle Allen started back to Orlando for the supply wagon. He rode all the rest of the afternoon on his tired horse and then started back with a wagon filled with food supplies, lumber, fence wire, and water, arriving at dawn the next morning. As the ten men had only dry bread for twenty four hours, he was a most welcome sight. During that first night the men slept on the ground using their saddles for pillows. Pansy, the brave little riding mare, had hurt her feet so badly on the flinty stones that she suffered greatly. In an effort to let my father know her suffering, she stood over him all night and would not be satisfied if he moved. When Uncle Allen started back again to Orlando, he led Pansy behind him leaving her at the farm where they had stayed while waiting for the run. Within the next few days, the mare had to be shot because her hooves were coming off. My father was greatly grieved at this as he had paid $100 for Pansy and was very fond of her. Father put up a wire fence around a small plot of ground and then went to Guthrie and proved on his claim. He brought back more lumber for a small shanty that the law required for homesteading. Also he had to plow a few furrows in his field. While bringing in the lumber, my father had an unusual experience when his horses stumbled at the edge of a stream. It was pouring rain and slippery, and the wagon turned over upsetting the lumber. Father crawled out and unhitched the horses, tied them to the wagon and laid lumber across to make him a shelter. He slept there all night. When morning came, he righted the wagon, reloaded his lumber, and went on to his claim. After building his shanty and fencing and plowing his plot of ground, my father left the claim and went back to his brother Allen’s farm where he had left his family.